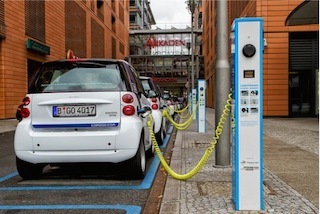 The photo here is of a Berlin street lined with electric vehicles recharging. Are we likely to see anything similar here in the U.S.? Electric Vehicles (EVs) aren't selling well in part because retail charging has stalled and people are afraid of being stranded with no power source. According to the US Census, there are 121,000 gas stations in the U.S. and just 9,124 charging stations. Refueling takes minutes with gas vs. 30 minutes to hours to charge. And payment systems to charge EVs are cumbersome to say the least. According to Plugincars.com's "Ultimate Guide to Electric Car Charging Networks," most public chargers are free for now, but those that are not free require subscriptions to be set up in advance. Using regular credit cards for a single charge is possible but complicated. The West Coast's ballyhooed "Electric Highway" is made up of six different charger providers, each requiring a different subscription and another card for your wallet. Some chargers don't fit every vehicle (!) and customer service can be terrible. It's just too early. Not surprising, most adventuresome new car buyers are skipping electric cars for now and buying another gas-powered vehicle to tide them over until the problems of range and public charging are solved. Clearly, the EV charging market requires standards. Despite utilities being widely reviled for high rates, they are trusted to distribute power and maintain the electric grid to fairly high standards. Electric utilities' reputation for providing overall reliability and consistency is well suited to win the confidence of potential EV drivers. (California's Pacific Gas and Electric) designed the (EV charger) project to help the state achieve its mandate to reduce its emissions by 80 percent below the 1990s levels by 2050. ...To achieve that, Gov. Brown issued an executive order in 2012 that calls for putting 1.5 million zero-emissions cars on the road by 2025. Why should utilities take on EV charging at all, a tough retail distribution business that EV owners expect to be free? Shouldn't the utilities be paying more attention to their core business, endangered by distributed solar energy provided by roof top solar panels? A 2013 report from Edison Electric Institute, the trade group for publicly-owned electric companies, warned about the disruption about to hit these utilities. Not only will utilities lose about 10 percent of their customers to roof top solar by 2020, but that loss would require increasing charges for remaining customers by about 20 percent, making solar panels even more attractive by comparison. Utilities have been fighting tooth and nail to keep solar installers out, including shutting down access to the grid, adding grid fees, and lobbying to regulate and tax solar alternatives out of the market. As it turned out, that strategy has kept the market open until they were allowed to enter. For example, NRG's CEO David Crane announced plans to participate in the charging market a year ago, stating that his company would straddle both models just as telephone companies straddled landline and cellular for twenty years before cellular became dominant. And the market in its home state of Texas is ready and waiting. Was it the boldness of their plans to move into charging stations that gave utilities the moxy to start installing their own distributed solar power? What caused utilities to act outside their staid character, whose normal instinct is to shut down innovation that threatens the status quo to align themselves with fossil fuel industries? The fact is, utilities are not only innovating but changing their core business model to accommodate cheaper and more ubiquitous solar power, a power source already visible across middle class neighborhoods, and one that might just save the electric companies from extinction. It feels like it all happened overnight, that our most conservative institutions have become bet-the-business proponents of green technology. Who knew? Photo courtesy of avda-foto via Flickr cc.